A picnic for 2, with a bottle of Sparkling Chandon NV Brut and two glasses all ready to enjoy. 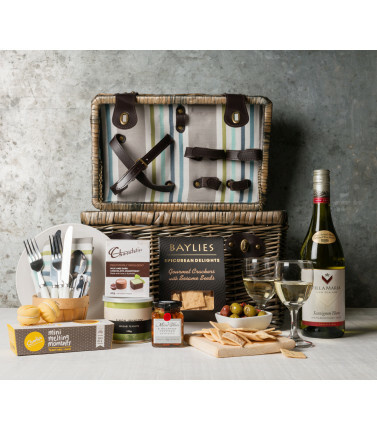 Your picnic hamper comes with nibblies along with plates and cutlery. It's real crockery and stainless steel forks, knives and spoons. (not plastic!). And don't even worry about the bottle opener because it's in there. Just bring along your picnic rug and your picnic basket and you're all good for a romantic afternoon. 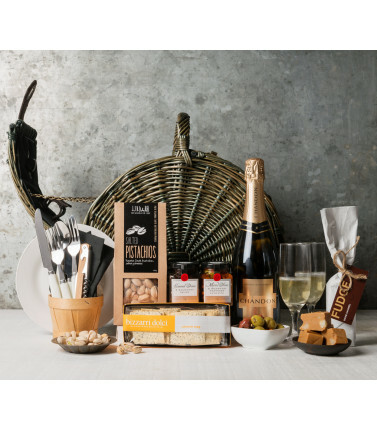 This picnic basket full of goodies is a great surprise gift for a birthday, anniversary or any special occasion that deserves a toast. 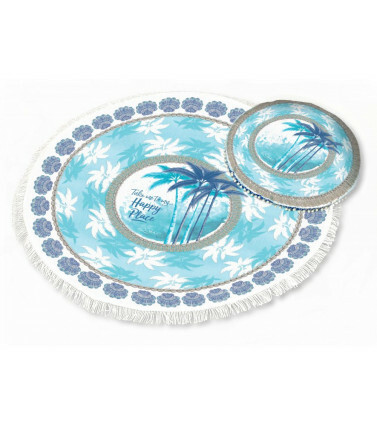 Two person champagne wicker setting including crockery plates, stainless steel forks, knives & spoons, bottle opener, cloth napkins and champagne wine glasses (glass). Presented with ribbon and gift card. Type your gift message below.